Preheat oven to 350. Line the bottom of a 9-inch springform pan with parchment paper. In a medium bowl, add 1 c flour, 3 tbsp sugar and the cinnamon, and stir together to blend. Add the cold butter and combine with your fingers or a fork until crumbly and just clinging together. Pat into the bottom of the pan to form a crust and put in the oven. Bake for 5 minutes. In a large bowl, beat the butter with a hand mixer (or in a stand mixer with a paddle attachment) until fluffy. Add the ¾ c sugar and beat another few minutes. Beat in egg and maple syrup. Add remaining 1 c flour and half and half, alternating, and beat until just combined. Pour batter over pre-baked crust and return to the oven. Bake for about 35 minutes or until a fork comes out clean. Let it cool. When ready to serve, gently cut around the edges of the pan and release the springform edge. 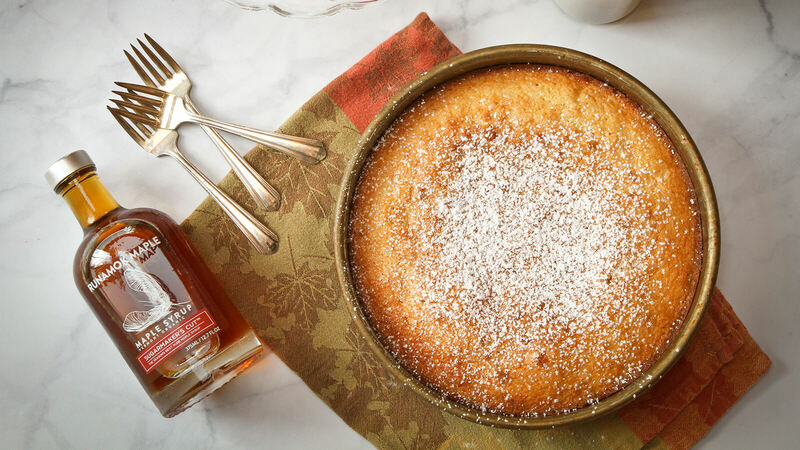 Place the cake on a plate or cake stand, dust with confectioner’s sugar and serve with any Runamok barrel-aged maple syrup on the side.